Lately I've noticed many many free market think tanks showing up on my "Suggested People to Follow" list on Twitter. I'm not sure if this is because the Twitter suggestion algorithm has improved to better reflect my interests, or these organizations have been beefing up their efforts in preparation for the electoral cycle, or some of both. I was curious how many of these free market think tanks are following each other. 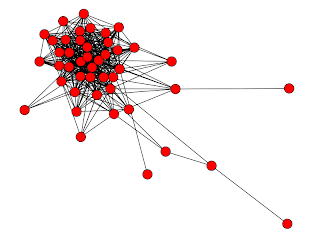 So I used some social network analysis tools to plot out what those follower relationships look like. I was hoping to see a diverse cast of players, connected perhaps by region or common interests. What I got instead was a hairball. Free Market Foundations, Centers, Institutes and Think Tanks. The process: I searched through all the accounts I was following for key words in their description or user name ("foundation", "center", "institute", etc.) and put them in a Python dictionary. I found 65 accounts. Then I went through everyone that follows each of those accounts, and if they were in that dictionary, added an edge between follower/followed accounts. At the center of that big cluster are some extremely prominent free market organizations, such as the Cato Institute and Mercatus Center. Around the edges of the cluster were state-specific free market institutes (The Platte Institute, Cascade Policy, Pioneer Institute in Boston, and so on) as well as some private parties who worked for or with those organizations. 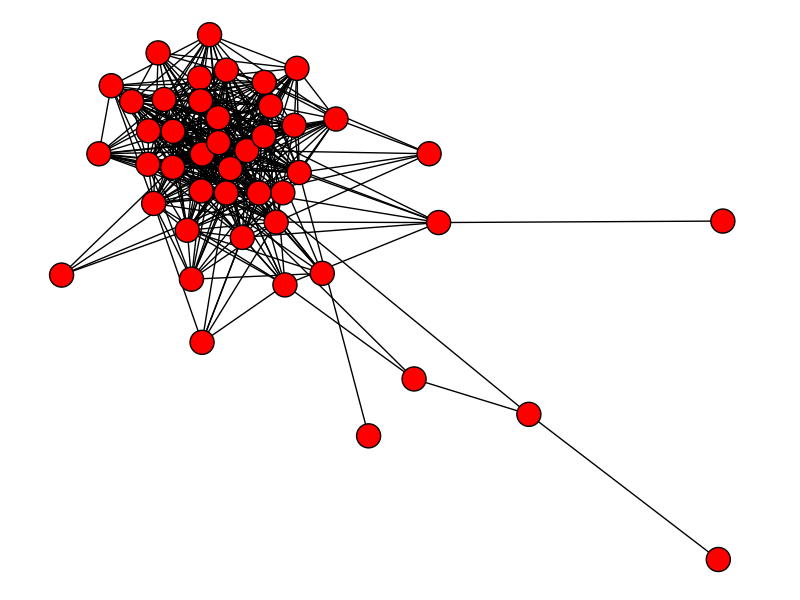 I have no way of comparing this network shape with pro-government or left-leaning organizations, because those don't happen to be in my Twitter network. This shouldn't be read as a criticism of these free market institutions. But it does reveal a bit about their social media marketing strategies. Nearly all of the free market institutions in my network go to great lengths to follow others of the same stripe. Anecdotally, I've noticed they retweet each other often as well. The social media teams at these institutes all appear to be on roughly the same page. Is this evidence for some grand collusion between libertarians, or influence of the "Kochtopus", as it has been described by some of the more hysterical commentators? Hardly. It's good social media strategy to follow those with common interests, because they'll be most likely to follow back or help spread a message. I'd bet this outcome is spontaneously occurring, not centrally planned. I don't have a way to evaluate how effective this strategy is: the network above doesn't measure the flow of tweets, only who follows whom. But it does say something about the political dialogue on Twitter -- in many cases, it's less of a dialogue and more of an echo chamber, regardless of which political persuasion you happen to follow.